Prime numbers are divisible only by 1 and by themselves. They stand in their place in the infinite series of natural numbers, squashed in between two others, liked all other numbers, but a step further on than the rest. They are suspicious and solitary… … among prime numbers there are some that are even more special. Mathematicians call them twin primes: they are pairs of prime number that are close to one another, almost neighbors, but between them there is always an even number that prevents them from really touching. The story is told in chronological order of ascending years with varying intervals. Nine year old Alice, in the opening chapter of the book, endures a horrific ski accident that leaves a permanent injury. Mattia, of similar age, decides to leave his mentally disabled twin sister, Michela, in a park while he attends a party. Michela subsequently disappears. The consequences of these two incidents on the emotional and social development of Alice and Mattia, as they mature into adults, are far-reaching and devastating. The teenage Mattia is very withdrawn and isolate himself socially, preferring to immerse himself in mathematics. He is a curious figure to his peers; some are even drawn to his sad, unreachable persona. Mattia self-mutilates by cutting. Alice is more accessible than Mattia; but she suffers from extreme anorexia and self-loathing. The two end up at the same high school and the first half of the book describes the growing relationship between these twin primes. Giordano’s handling of Mattia and Alice during their teenage years is quite masterful. He quite successfully, with a sparse, yet poetic, narrative fleshes out two very tormented young people, who are emotionally frozen in relation to the people around them but are more fluid with each other. Mattia and Alice, by the end of their teenage years, are able to fashion out a way of relating to each other within the tortured confines of their psyches. She was identical to me. Completely identical to me. But this goes nowhere. Towards the end, Michela is dragged into the story as a ploy to justify the return of Mattia to Alice. Surely, Alice could have written “The roast is in the oven. Come get some” and Mattia would have hopped on the next plane. Mattia’s reaction to Alice’s summoning and his subsequent inaction makes sense within the context of their friendship; the nature and the limits of which were established and set by the end of the first sections of the book. In short, I don’t think I would have missed much if I chose not to read the last hundred or so pages of the book. 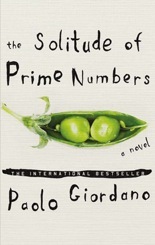 My rant against the second part aside, The Solitude of Prime Numbers is a well-written book. It is quite evident that Paolo Giordano has considerable talent. His prose is graceful and there are passages in the book that are just superb. There is an aura of melancholy and loss, in step with the story, which I loved. The translation by Shaun Whiteside must be perfect because the book reads so well. It is quite an achievement for a debut. But, and as I divined, I did not love it. I find it interesting that you found the first half so much better than the second half. I’m definitely intrigued. I also loved this book – it’s unlike anything I have read and I never knew where the story was going, which worked for me. I love how the author left me wondering what happened (ie: the tomato incident) and never told me…. I’m still wondering. LOL! I’m so pleased that you managed to divine your feelings correctly! I look forward to reading any other books that he writes in the future as he does have a talent. I really loved this book; it’s one for my favorites for 2010. I did like the first half best but really enjoyed it all. Great review. Thanks. I’m glad that you enjoyed it. I liked the first half but it didn’t hold my attention after that. Wonderful review kinna! You did a great job in exploring what you liked and didn’t like about the novel. I think you’re spot on: the latter half of the book isn’t that engaging because the characters become stuck in their patterns. Somehow that struck me as very odd, since people generally grow a lot during their 18th-24th birthday. Like you, I did not love it. Nevertheless, some passages stood out and that makes me very curious to see how he’ll develop as a writer. Like you, I hope he continues to write. I don;t read much YA fiction but I imagine that the book fits more with that genre.